Full disclosure, this Roasted Pear Martini might just become your go-to celebratory sipper for fall! I’ve had my favorite fall cocktail on lock down for almost 3 years now, but this pear and cardamom flavored martini is really something special and it tastes like it. I love fall produce of all kinds, you know that, but in my personal opinion there isn’t a big enough buzz made during the fall about pears! I swear once September hits everyone jumps right on the apple and pumpkin band wagon and forgets all about the beautiful pears that are at their peak right now. Other than eating my weight in fresh D’Anjou and Tosca pears, one of my favorite ways to prepare them is to make a super versatile pear sauce to keep on hand in my fridge. I use pear sauce for ALL sorts of things! 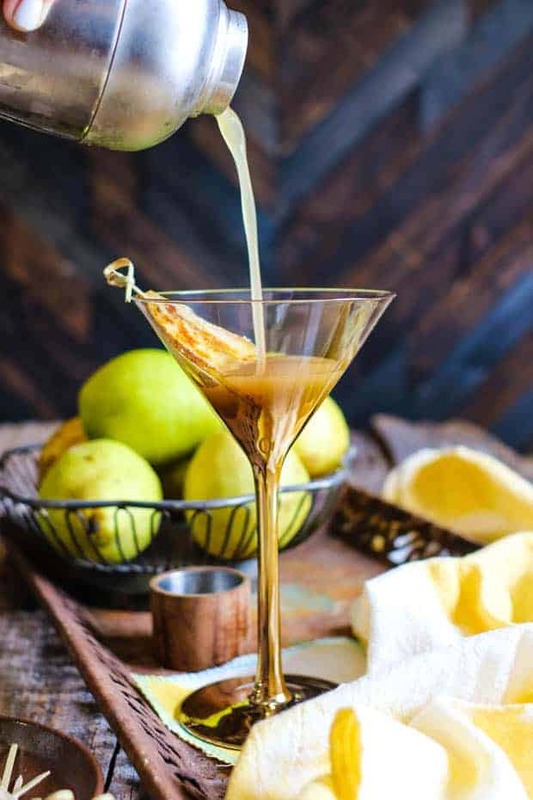 Kid’s (and adults) will love snacking on bowls of pear sauce just as it is, you can use pear sauce anywhere you would use apple sauce in baking recipes, or you can invite your friends over and mix it up into a fancy Roasted Pear Martini like I do. While I have enjoyed many a martini out and about they have always intimidated me a bit when it came to making them at home. I don’t know why, it just seemed like they should be harder to make than they actually are I guess. At any rate, once I decided to jump in and create a martini recipe I knew that I better do a bit of research first. If you are a martini making pro, I feel confident you already know the answer to these, but if you are a newbie like me I figured I’d break it all down for you. Gin or pear vodka, which one will you choose? This may be your hardest decision make in the entire martini making process!! My girlfriend’s and I all agreed that we really like pear vodka in this recipe. It really amplifies the flavor of the roasted pear sauce and yields a sweeter martini. Just be careful, because the pear vodka makes this martini so easy to sip you might question whether there was alcohol in it at all. My husband on the other hand is all about the gin in this martini. The piney flavor of gin actually pairs really well with the roasted pears and cardamom too, but it remains very prevalent in the finished drink and creates a cocktail that is a bit more savory which for me lends itself to slower sipping. Now that you’ve got the liquor sorted out you need to decide what type of simple syrup you will be creating. 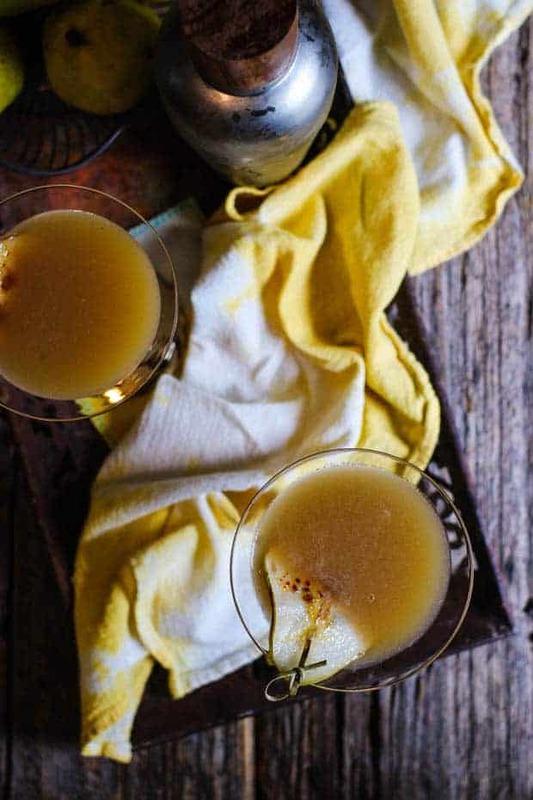 Do you have some time for the cardamom infused syrup to work nice and slow or are you in a rush to sip on a Roasted Pear Martini? There is really no wrong answer here and I’m going to provide you with recipes for both situations. If you are planning for a girls night in or a holiday feast you probably have a few days and can afford to make the whole cardamom pod infused simple syrup. This syrup takes 3 days to come to its full flavor, but it is SO worth it! You can really taste the richness of it in the martini. 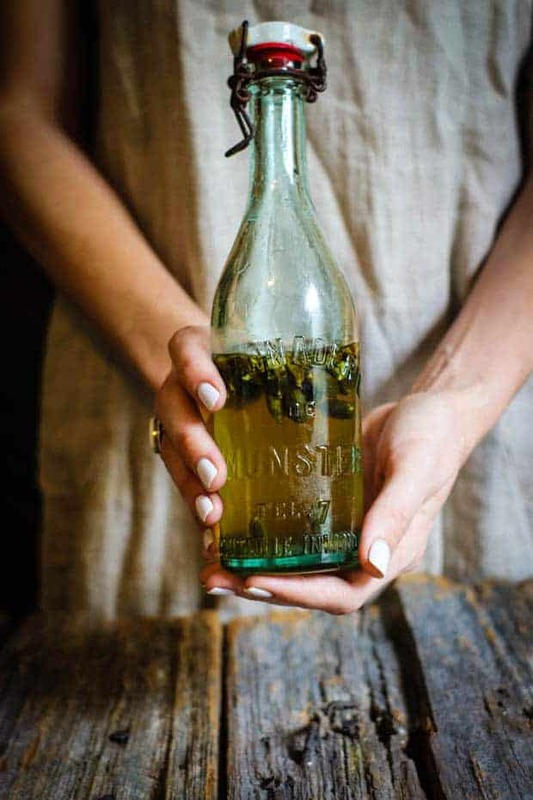 However, if you are hosting an impromptu gathering or you just want to quickly create a few fancy cocktails for tonight’s date night in you can make a great cardamom syrup in less than 10 minutes on the stove using ground cardamom. The flavor won’t be nearly as intense as the whole pod syrup, but it is still really delicious! No matter which liquor you choose or which syrup method you choose the one thing that is for certain is any way you shake these up they’re delicious! Ready to wow your friends and family with your martini making skills? Simply click here to go to the Stemilt website for the full recipe. 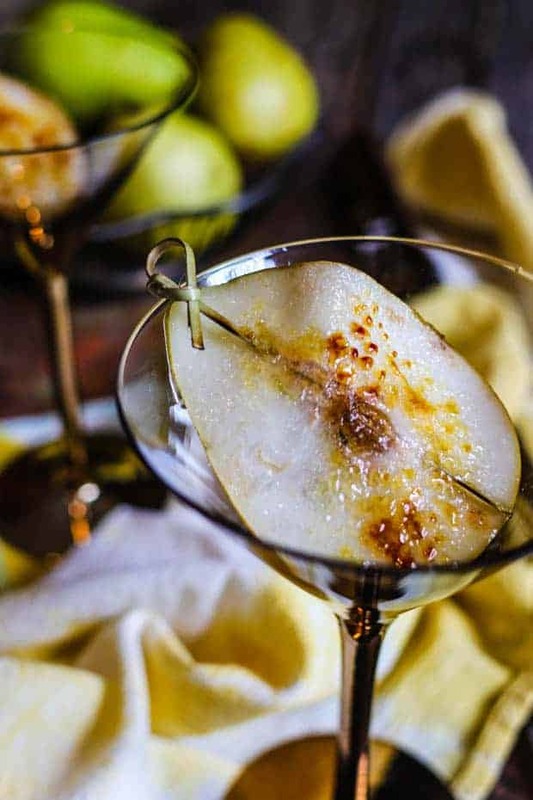 If you’ve made this Roasted Pear Martini or any other recipe on our site then don’t forget to rate the recipe and let me know what you thought in the comments below, I love hearing from you! You can also FOLLOW ME on FACEBOOK, INSTAGRAM, TWITTER, and PINTEREST to see more delicious food, design, and decor. This looks amazing and OMG you’re the cutest! You are the sweetest! Thank you so much, wish we could share one of these!! Very Cool Idea. I will have to try this one. Would certainly “pear” well with a smoky cheese. Martinis and cheese plates FTW!! !